A Bejewelled Journey to experience, learn and network with the best of the jewellery industry! Educating yourself in the field of your expertise is a very important step, when wanting to create a place for yourself in the industry. But most of the times, education is limited to college courses and beyond that one gets strangled in work life and education ceases to grow. 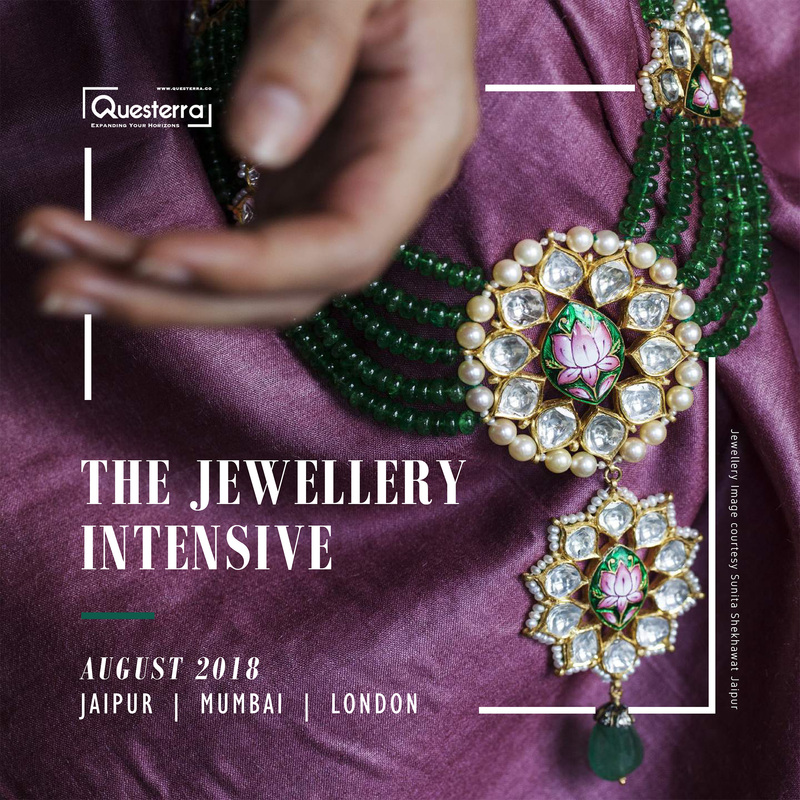 To break this mold, I have partnered with Questerra, (an experiential travel platform that helps one learn, network and grow in their relevant industries) and created a unique course called ‘THE JEWELLERY INTENSIVE’ that will help you experience, learn and network in the jewellery industry. And what better to learn from the industry stalwarts, each of whom are strong pillars of this industry. What is The Jewellery Intensive? Learn and experience first hand the intricacies of the jewellery industry with a 15 day Intensive scheduled to take place in the second half of August 2018 (Exact dates will be announced soon). This wholesome learning experience will span three cities, each of which personify a unique taste in jewellery. Experience the glitz and shine of the jewellery industry along with the sweat and toil that goes into making signature pieces. What is the going to be the learning? The Intensive covers three basic pillars of the jewellery industry – TRADITION. TRADE. DESIGN. And, spans the beautiful and bustling cities of Jaipur, Mumbai and London that are the most well known hubs for everything jewellery. From sourcing gems, to learning the tricks of the industry, topped with international trends and styles, we bring to you the best these cities have to offer a jewellery passionate soul. What will we see and who will we meet? ~Visits to museums like Gyan Museum, Amrapali Museum, V & A Museum London and exhibitions displaying British royal family jewels and more. ~Visits to the best of jewellery making factories and workshops in India & London. ~Meetings and interactions with industry leaders like Tarang Arora of Amrapali, Sunita Shekhawat, Farah Khan, Poonam Soni, Anand Shah, Nirupa Bhat of GIA, Katerina Perez and many more. Who are the organizers and the curators? Who will benefit from this Intensive? The Jewellery Intensive is specially designed for anyone and every one who is passionate about jewellery. If you like the above idea and wish to travel with us on this once-in-a-lifetime experience, apply here. To download the detailed brochure, click here. Next post: India’s Coolest Store Awards 2018- Have you applied yet?